Over the past few years, eggplant have grown exceedingly well in my garden. This is a good thing, given how much Jill and I both like it. 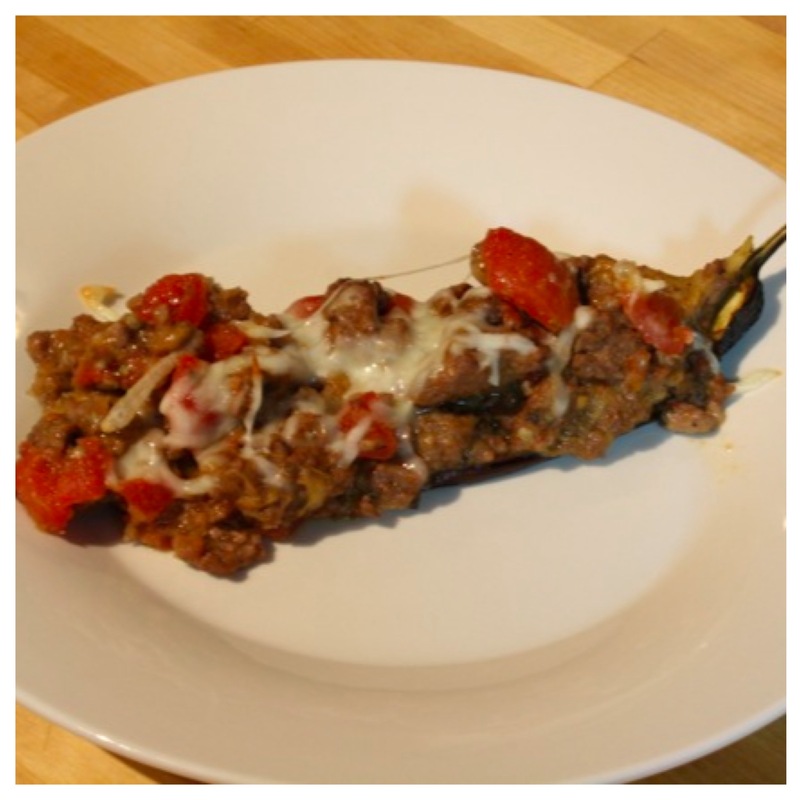 Experimenting with new ways to prepare eggplant, I came up with this simple, delicious stuffed eggplant recipe. The first step in preparing the stuffed eggplant is to roast the eggplant. Slice two eggplant in half lengthwise. Season each of the four halves with salt and pepper. 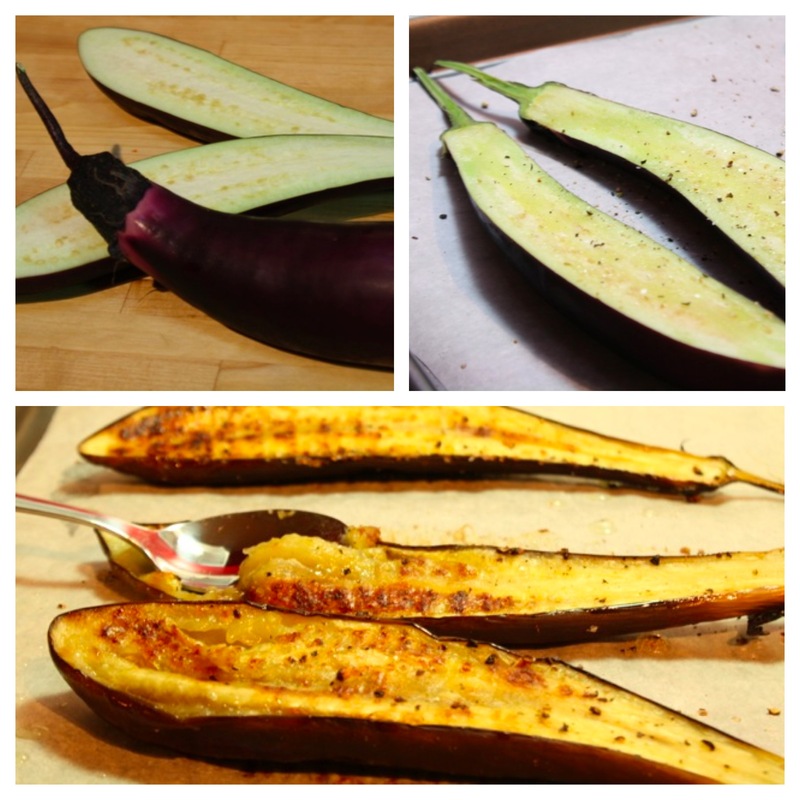 Drizzle the eggplant liberally with olive oil and place them cut side down on a baking sheet. In a 400 degree oven, roast the eggplant for 20-25 minutes, until the flesh of the eggplant have a nice golden brown color. Remove the eggplant from the oven and let them cool. While the eggplant cools, brown a pound of ground beef in a skillet. I used ground beef because I made this while Jill was out of town. 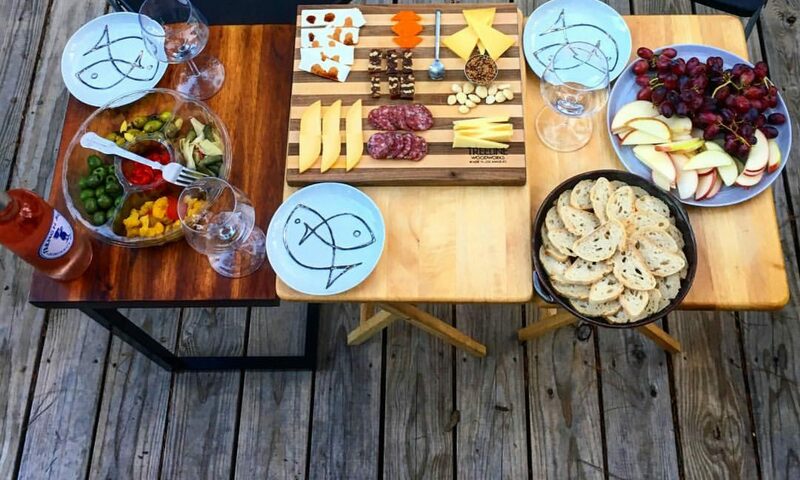 I’ll probably make it with ground turkey next time. Stir in a can of diced tomatoes (I used diced tomatoes seasoned with garlic and oregano). Use a spoon to scoop the roasted eggplant flesh out of the eggplant skins, being careful to avoid tearing the eggplant skin. Mix the eggplant flesh into the ground beef. Season the mixture with about two teaspoons of Turkish seasoning (or a blend of salt, pepper, cumin, oregano, paprika, and coriander). Crumble a little bit of goat cheese (about an 0.5 oz) into the mixture and stir to help bind the ingredients together. Stuff the eggplant skins with the mixture and top with shredded mozzarella cheese. Bake the stuffed eggplant in the oven at 350 degrees for 5 to 10 minutes, until the mozzarella melts and bubbles. Although this recipe was completely an experiment to begin with, it turned out to be one of my favorite things I’ve prepared in a while. The meal was quick, tasty, and only used a couple of ingredients. The most time consuming part of this dish is waiting for the eggplant to roast, but you can save time by prepping the other ingredients during this time. 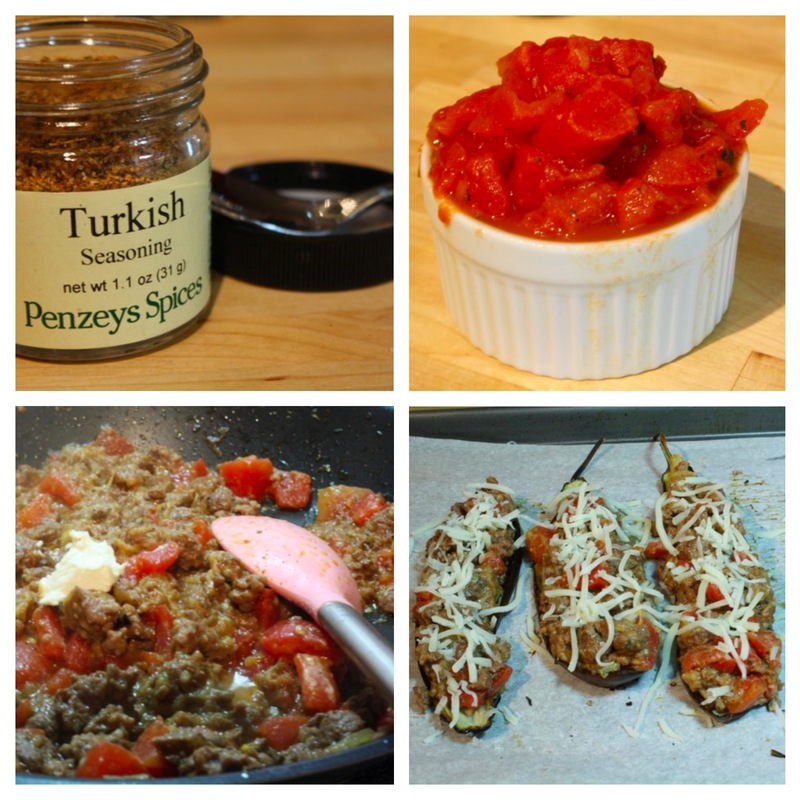 The Turkish seasonings infuses the ground beef with flavor and complements the eggplant. With several more eggplant currently growing in my garden, I will be making this recipe again and will continue to experiment with new eggplant recipes. 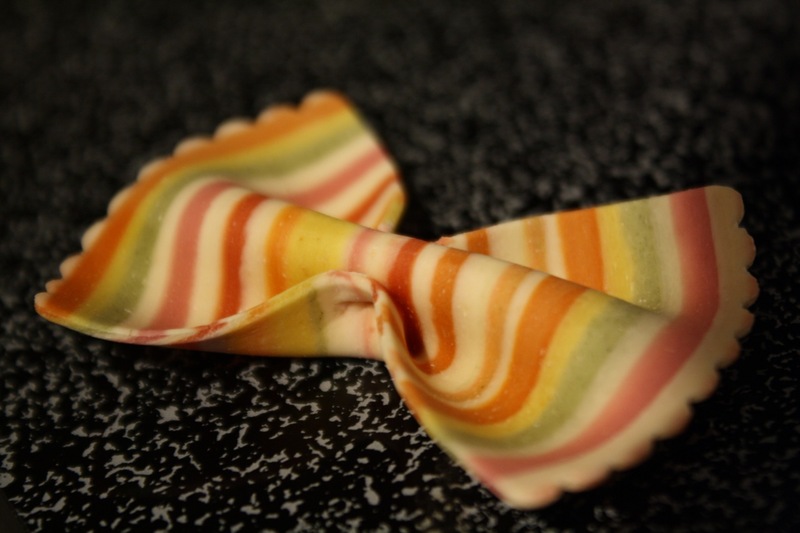 These fun bow-tie pastas had such unique multicolored striping, we didn’t feel that covering them in a jar of pasta sauce would do them justice. 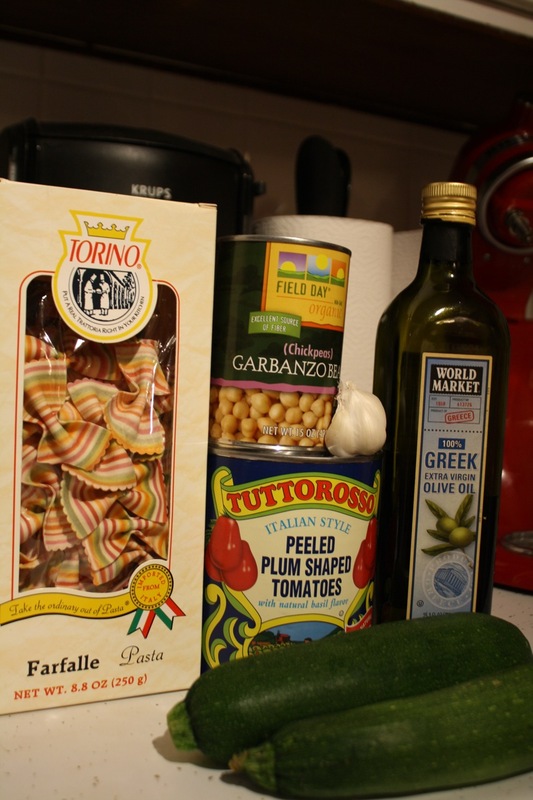 Instead, I opted to serve the pasta with an assortment of vegetables that mimicked the colors of the pasta. 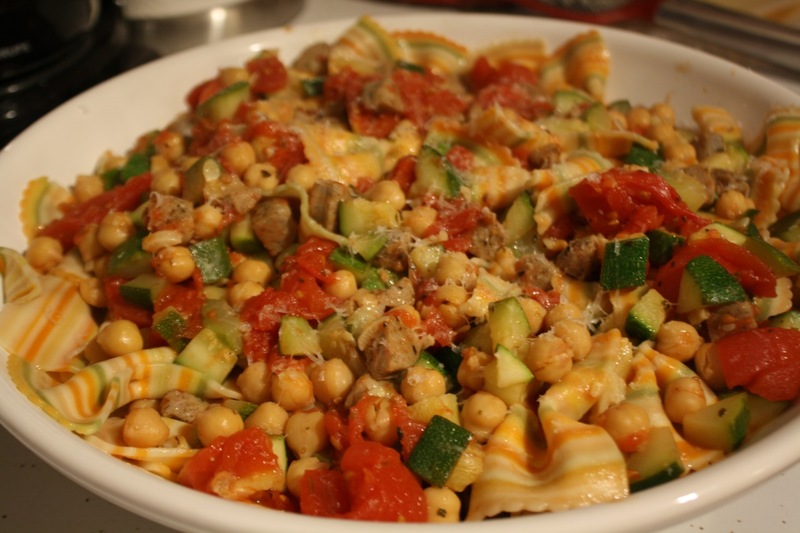 To mimic the red, green, and beige stripes on the pasta, I decided to serve the pasta with tomatoes, zucchini, and chickpeas. While the pasta boiled in salted water, I sautéed a couple cloves of garlic in olive oil over medium heat. I added diced pre-cooked chicken sausage and sautéed until the edges started to turn light brown and crispy. 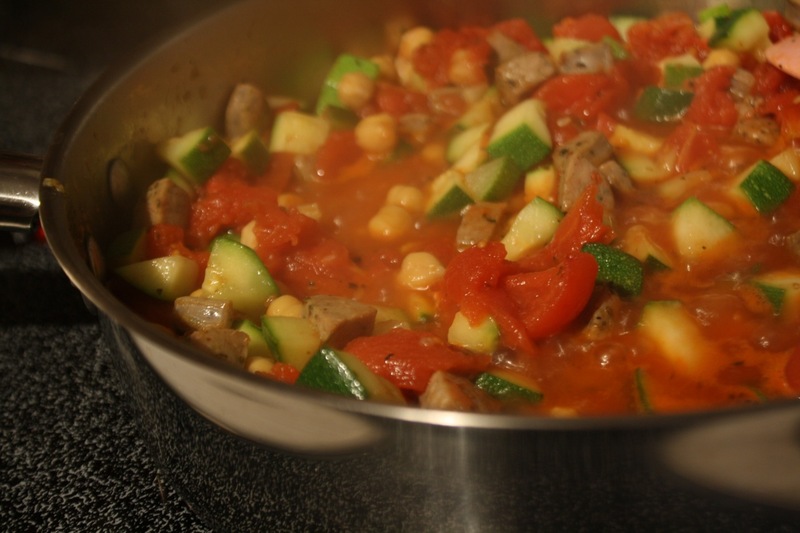 I added diced zucchini and a can of peeled plum tomatoes. I seasoned the mixture with salt, pepper, dried oregano, and dried basil. When the mixture cooked long enough to soften the zucchini (about as long as it took the pasta to finish cooking), I drained off the excess liquid from the sauce (the canned tomatoes can be a little big juicy) and gently folded in the pasta. The dish was topped with freshly grated parmesan.